This book is a selection of the most relevant contributions to the LCM 2011 conference in Berlin. The material explores scientific and practical solutions to incorporating life cycle approaches into strategic and operational decision making. There are several sections addressing methodological topics such as LCSM approaches, methods and tools, while more application-oriented sections deal with the implementation of these approaches in relevant industrial sectors including agriculture and food, packaging, energy, electronics and ICT, and mobility. PART I: LCSM Approaches.- 1. Integrating Sustainability Considerations into Product Development: A Practical Tool For Prioritising Social Sustainability Indicators and Experiences From Real Case Application.- 2. A Life Cycle Stakeholder Management Framework For Enhanced Collaboration Between Stakeholders with Competing Interests.- 3. Stakeholder Consultation: What Do Decision Makers in Public Policy and Industry Want To Know Regarding Abiotic Resource Use?- 4. 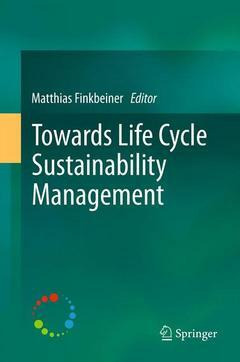 Life Cycle Management Capability: An Alternative Approach To Sustainability Assessment.- 5. The Sustainability Consortium: A Stakeholder Approach To Improve Consumer Product Sustainability.- 6. A Social Hotspot Database For Acquiring Greater Visibility in Product Supply Chains: Overview and Application To Orange Juice.- PART II: LCM Methods and Tools.- 7. A Novel Weighting Method in LCIA and Its Application in Chinese Policy Context.- 8. The Usefulness of an Actor’s Perspective in LCA.- 9. Review on Land Use Considerations in Life Cycle Assessment (LCA): Methodological Perspectives For Marine Ecosystems.- 10. Visual Accounting.- 11. International Reference Life Cycle Data System (ILCD) Handbook: Review Schemes For Life Cycle Assessment.- 12. Time and Life Cycle Assessment: How To Take Time Into Account in the Inventory Step?- 13. A Method of Prospective Technological Assessment of Nanotechnological Techniques.- 14. State of the Art Study - How Is Environmental Performance Measured For Buildings/Construction?- PART III: Water Footprinting.- 15. Comparison of Water Footprint For Industrial Products In Japan, China and USA.- 16. Assessment of the Water Footprint of Wheat in México.- 17. Water Footprints in Four Selected Breweries in Nigeria.- 18. Development and Application of a Water Footprint Metric For Agricultural Products and the Food Industry.- 19. LCA Characterisation of Freshwater Use on Human Health and Through Compensation.- PART IV: LCM Of Processes and Organisations.- 20. How To Measure and Manage the Life Cycle Greenhouse Gas Impact of a Global Multinational Company.- 21. Best Practice Application of LCM By Retailers To Improve Product Supply Chain Sustainability.- 22. Life Cycle Management Approach To the Design of Large-Scale Resorts.- 23. Greening Events: Waste Reduction Through The Integration of Life Cycle Management Into Event Organisation at Esci.- 24. Challenges For Lcas of Complex Systems: The Case of a Large-Scale Precious Metal Refinery Plant.- 25. Life Cycle Inventory of Pine and Eucalyptus Cellulose Production in Chile: Effect of Process Modifications.- 26. Life Cycle Assessment of the Integrated Solid Waste Management System of Delhi.- 27. LCM of Rainwater Harvesting Systems in Emerging Neighborhoods in Colombia.- PART V: LCM in the Agriculture and Food Sectors.- 28. Environmental Profiles of Farm Types in Switzerland Based on LCA.- 29. The Use of Models to Account For the Variability of Agricultural Data.- 30. Modular Extrapolation Approach For Crop LCA - MEXALCA: Global Warming Potential of Different Crops and Its Relationship to the Yield.- 31. Regional Assessment of Waste Flow Eco-Synergy in Food Production: Using Compost and Polluted Ground Water in Mediterranean Horticulture Crops.- 32. Assessing Management Influence on Environmental Impacts Under Uncertainty: A Case Study of Paddy Rice Production in Japan.- 33. Assessing Environmental Sustainability of Different Apple Supply Chains in Northern Italy.- 34. An Effect of CO2 Information Labeling For the Pork Produced With Feed Made From Food Residuals.- PART VI: LCM In the Packaging Sector.- 35. Role of Packaging in LCA of Food Products.- 36. Packaging Legislation and Unintended Consequences: A Case Study on the Necessity of Life Cycle Management.- 37. Carbon Footprint of Beverage Packaging in the United Kingdom.- 38. Enhanced Resource Efficiency With Packaging Steel.- 39. Damage Assessment Model For Freshwater Consumption and a Case Study on PET Bottle Production Applied New Technology For Water Footprint Reduction.- PART VII: LCM in the Energy Sector.- 40. Sustainability Assessment of Biomass Utilisation in East Asian Countries.- 41. Life Cycle Inventory of Physic Nut Biodiesel: Comparison Between the Manual and Mechanized Agricultural Production Systems Practiced in Brazil.- 42. Life Cycle Assessment of Biodiesel Production From Microalgae Oil: Effect of Algae Species and Cultivation System.- 43. Modeling the Inventory of Hydropower Plants Prioritising Social Sustainability Indicators and Experiences From Real Case Application.- 44. Lifecycle Carbon Dioxide Emission and Stock of Domestic Wood Resources Using Material Flow Analysis and Life Cycle Assessment.- 45. Analysis On Correlation Relationship Between Life Cycle Greenhouse Gas Emission and Life Cycle Cost of Electricity Generation System For Energy Resources.- 46. Development and Application of a LCA Model For Coal Conversion Products (Coal To Y).- PART VIII: LCM in The Electronics and ICT Sectors.- 47. European LCA Standardization of ICT: Equipment, Networks And Services.- 48. Product Carbon Footprint (PCF) Assessment of a Dell Optiplex 780 Desktop – Results and Recommendations.- 49. State of the Art in Life Cycle Assessment of Laptops and Remaining Challenges On The Component Level: The Case of Integrated Circuits.- 50. The Concept of Monitoring of LCM Results Based on a Refrigerator Case Study.- 51. Life Cycle Management of F-Gas-Free Refrigeration Technology: The Case of F-Gases Free Frozen Dessert Equipments.- PART IX: LCM in the Mobility Sector.- 52. Assessment of the Environmental Impacts cf Electric Vehicle Concepts.- 53. A Consistency Analysis of LCA Based Communication and Stakeholders Needs To Improve the Dialogue On New Electric Vehicles.- 54. Design For Environment and Environmental Certificate at Mercedes-Benz Cars.- 55. Implementing Life Cycle Engineering Efficiently Into Automotive Industry Processes.- 56. Environmental Product Declaration of a Commuter Train.- Index.